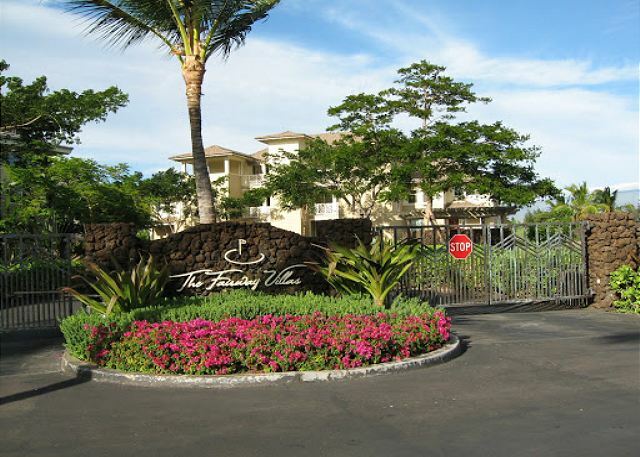 Gated Community conveniently located near shopping, dining, and just 1000 steps to the sandy beach at A-Bay! Relax by the Infinity Edge Pool and Jacuzzi overlooking King's Lake. 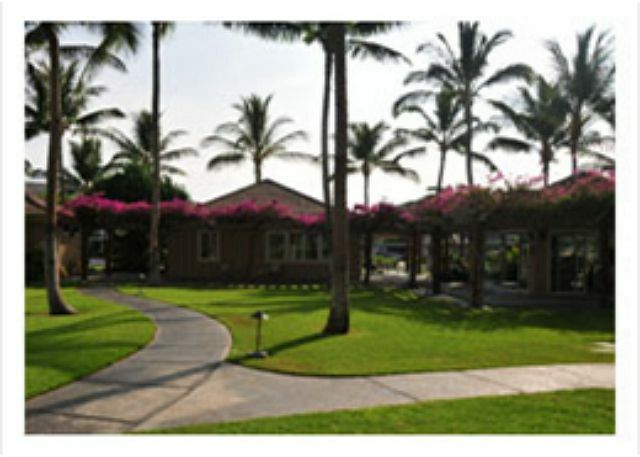 Tropical gardens and landscaping throughout the Fairway Villas. 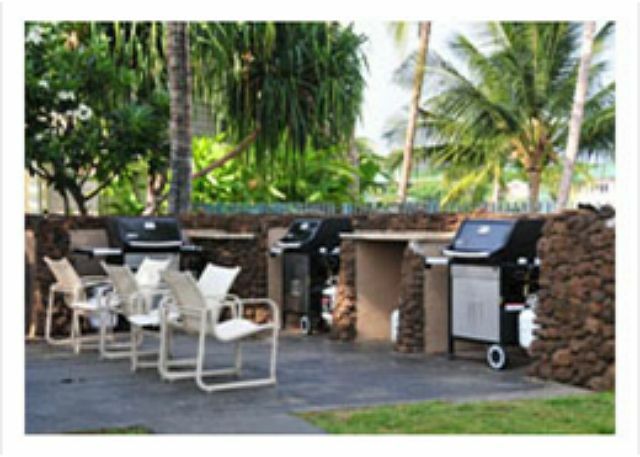 Plenty of grills located near the pool! Shape up in the open air Fitness Hale! 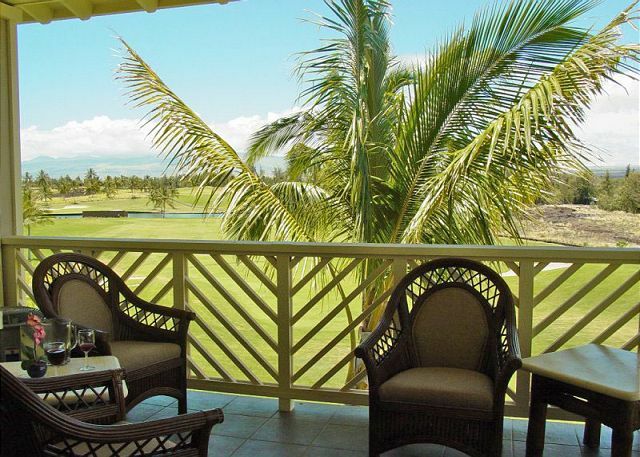 Relax on your private lanai with views of Mauna Kea and Waikoloa Beach Golf Course. Living Area with Queen Sleeper Sofa and Desk Area with FREE Secure WIFI Access. 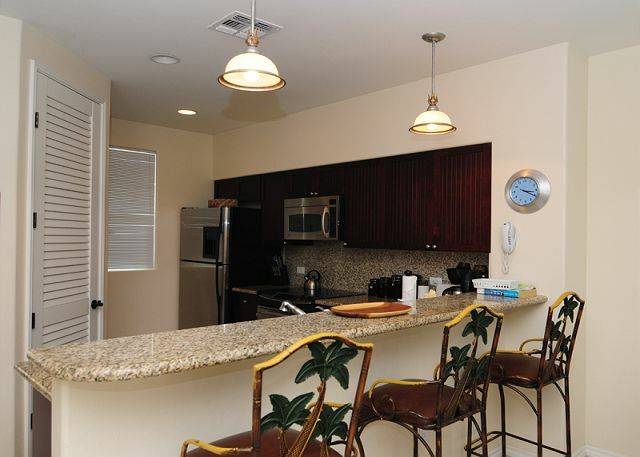 Fully equipped gourmet kitchen includes everything needed to prepare meals for the entire family! 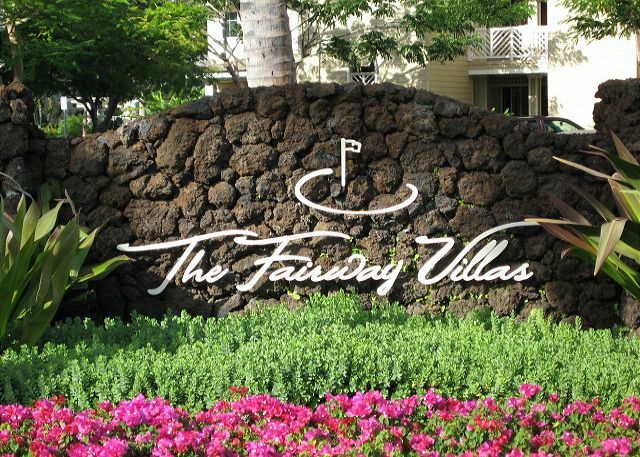 Luxury King Size Bed with Cable TV/DVD Player overlooking Waikoloa Beach Golf Course. 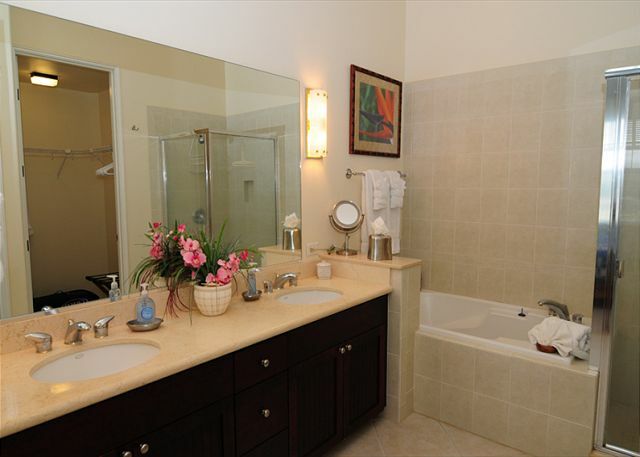 Features Double Sinks, Walk-In Shower and Jacuzzi Soaking Tub. 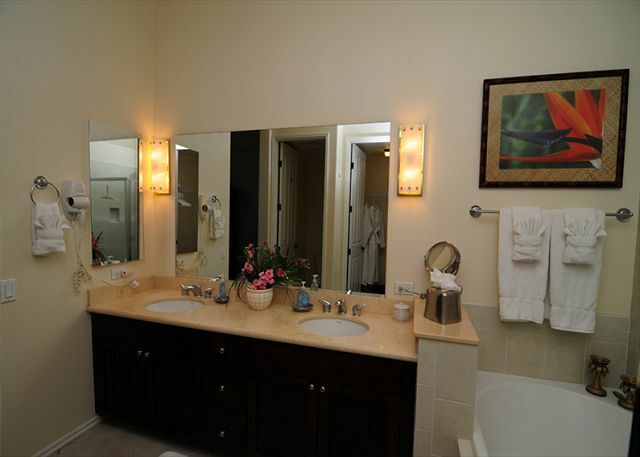 Features Double Sinks with Separate Shower, Soaking Tub, Makeup Mirror, Hairdryer, Iron and Ironing Board, Bathrobes too! Luxury Queen Size Bed with Cable TV/DVD Player. 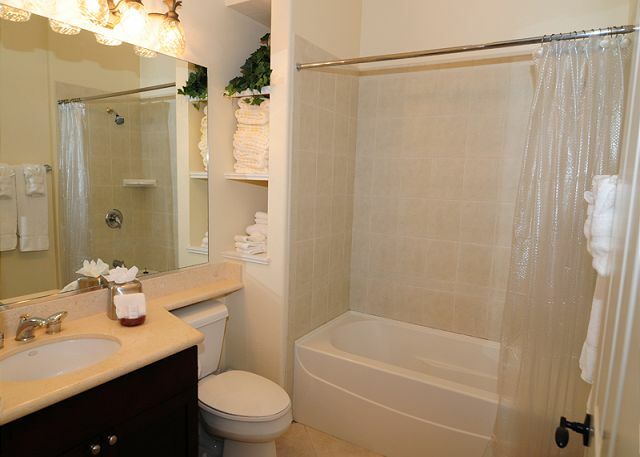 This hall bathroom includes tub/shower combo, bath linens, beach towels and hairdryer too! 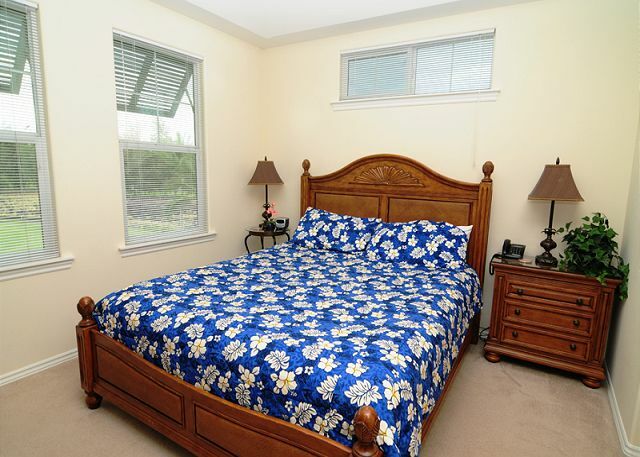 This bedroom features 2 Twin Beds with optional King Bed upon request at time of booking. 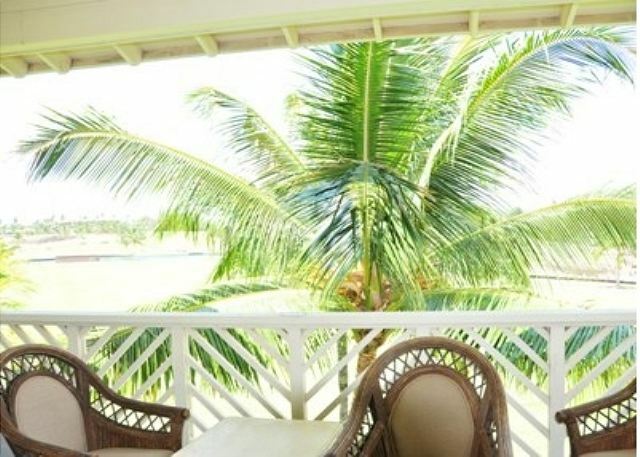 Experience the warm, refreshing trade winds of the Pacific Ocean from this private top-floor corner location which maximizes the tropical breezes. 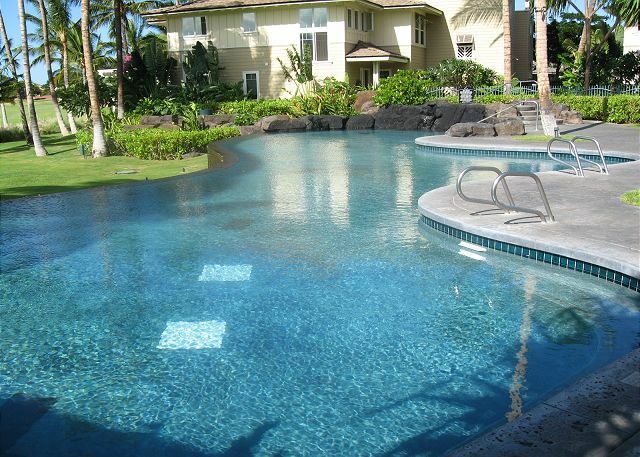 This 3-story building features Hawaiian Plantation Architecture with elevator access. Your reserved parking space is conveniently located near the elevator and additional guest parking is located nearby. The Master Bedroom enSuite features a deluxe King Size Bed with flat screen TV w/DVD player and Soaking Tub. Bedroom 2 has a Queen Size Bed and the upstairs Loft Bedroom 3 has 2 Twin Beds. A Queen Sleeper Sofa is also included in the living room. Port-a-Cribs are available by request in your reservation comments for additional $50 rental fee. A desk area with FREE WIFI access is conveniently located in the living room. A fully equipped gourmet kitchen includes everything needed to prepare meals for the whole family. This popular Fairway Villas property is professionally represented by Sandy Vacations, LLC a family owned and operated business since 1999! This Penthouse Villa features our secure keyless lock system which provides a new personal entry code for each guest with easy access for every member of your family and is ready for your vacation in paradise! Please note this property is for sale and it may be necessary for agents to show the unit during your stay. The condo had a great location, it was clean and everything worked. The furnishings, tv's, and cookware are old. The condo is "for sale". We had one issue with a potential purchaser entering the condo without notice and without a realtor, which we found odd and concerning. We contacted the property management, expressed our concern, and Sandy Vacations said they would raise our concerns with their realtor. We had no other issues. We would recommend the condo and would be pleased to return for another vacation stay in future. It was great and worked out perfect for our family. Our boys loved the up stairs:) Thank u so much!!! The condo was perfect for us. It was simple, affordable, very clean and Sandy was easy to communicate with. We're so happy to receive this review. We have made significant changes with regards to some previous issues and this review acknowledges we did the right thing! Mahalo! It was a perfect weekend, a nice unit. Only on our second day we got locked out of the unit because Sandy did not add another day to our stay. Needed a new code to the door. We had left the unit to bring the grandkids (9 month old, & 4 year old) to the pool. Forgot the sun screen in the unit and could not get in! Called the Sandy Vacations # and no answer! Finally after almost 2 hrs we got a hold of Sandy. There was no apologies or compensation for the inconvenience. I had left a few not so good messages on her line. I was fuming! Also the dryer made so much noise that we could hear it from our car parked down stairs! Make sure you get the codes to the front door for the whole stay or you will be locked out! Another thing the phone did not work so I had to use my cell phone to check in and out. We are very sorry for the inconvenience this guest experienced. This was due to the fact that they added an additional night after they booked and the original code provided in our app had expired. We contacted this guest to issue their new code and left messages however apparently they did not receive them. We did offer them a late checkout for the inconvenience. A two night Vista with eight gueats. Upon departure I had made a list of things that were loose, loud and broken, that was not contributed by our party. We were required to pay a $200 cleaning fee but we're responsible to take out our own trash and wash, dry and fold our own towels. The dryer was not performing well. It was loud and took long to dry 3 batches of towels. Pull our bed had a lumpy mattress. 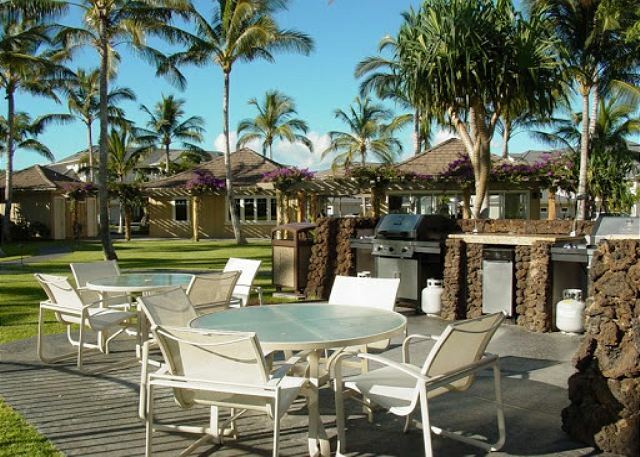 The property met our needs that weekend; close to the Waikoloa Hilton and roomy enough to provide a space for our daughter and her friends to get ready for their prom. Interior could use some updating, especially the kitchen utensils and cookware. Paper goods promised at check in were not available. We were not very happy that we paid a cleaning deposit and had to remove all our trash when checking out. I was pleased with the size and location of this rental. Short easy walk to the Fairway Villas pool, which has a great view of the Kings Shops. Although initially having trouble getting in touch with Sandy Vacations, they were very accommodating to our requests once contacted. Check-in & check-out calling procedures was fast and easy. Check-in Instructions were clear and concise. Check-out procedure was easy and simple. Only request I would make is the A/C unit be turned on shortly before a guests schedule arrival. Even though the fans were on it was like walking into an oven and because of the size of the condo it didn't cool down right away. Our family thoroughly enjoyed our stay at your vacation rental. We will definitely return. Thank you!!! My family & I had the most memorable experience during our vacation stay. We didn't want the vacation to end & till now I still daydream about it! Highly recommend using Sandy Vacations! We thoroughly enjoyed our stay and would recommend Sandy Vacations to all of our friends. Sandy was helpful with all of our questions and very accommodating to any requests. I would definitely stay there again the next time I return to Hawaii. Susan J from Buckeye, AZ does not recommend this vacation rental. 3rd floor, nice view of the tee box and fairway, quiet, non smoking complex, well equipped. A/C not adequate the first night as the cleaners had left the door open and the place heated up. By morning it was comfortable, but the property manager never answered the email we sent on Saturday evening when we checked in. Dining chairs were less than comfortable, but provided their purpose. Instructions on how to operate the air conditioning is on the thermostat. In an effort to conserve energy, all windows and doors must be closed for the air conditioning to turn on. The condo was as described--nice, clean 2 bedroom, 2 bathrooms on main floor with additional loft bedroom. It was within walking distance of the Queen's Market for shopping. Sandy Vacations personnel were prompt and courteous with communications. My husband would have enjoyed at least one high definition television; all 3 TV's were old, no flat screen, hi-def. There was wear of some of the furniture, especially coffee table. Overall, nice, quiet, well-kept condo units. Nice condo. Good condition, nice little community and close to airport. Easy to book and easy to get to. Sheets and towels were clean. Only complaint is that there is no wifi like it says. I don't mean that it was not working, I mean there isn't wifi. i am a IT person from Seattle and needed it, but to be fair all the other reviews say the same thing about the wifi and I choose to take a chance on it. This property does have WIFI.. I'm not sure what the problem was here, unfortunately this guest did not contact management during their stay to resolve any connectivitiy issue they apparently were experiencing. Great time on the Big Island despite Hurricane Iselle! Easy to check in and out. Furniture a bit worn and the hot water was just above luke warm. Overall we had a great time and would probably return. We were pleased about how nice everything was. Great location! The 3rd bedroom (loft) isn't ideal for adults. 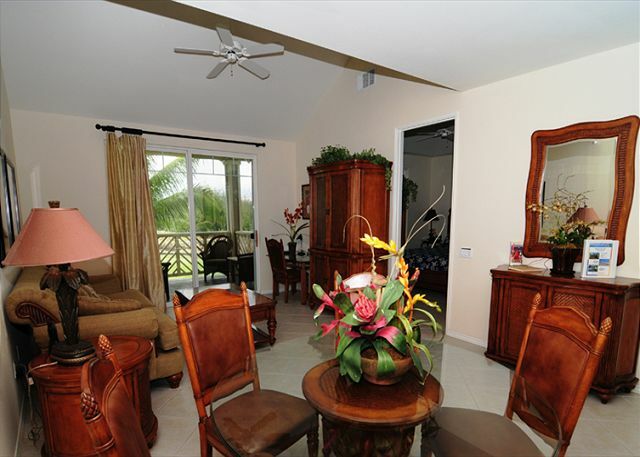 Lovely location, condo was quiet with great views. The linen however was not spotless, pillows were stained and mattress covers needed to be washed. There could have been more towels, the condo slept 6 but we had to buy more towels so we would have enough for the pool too. This was our only complaint but for the price these things should be attended to. We would have been happy to bring this guest more towels had they requested this during their stay. All new bath and pool towels have been purchased. Mattress pads and pillows have been cleaned and will be cleaned regularly now with our new housekeeping service. Property was very nice w/great access to amenities. Did have service problems w/the elevator several times. Would definitely use this place again. Came here for 2nd time and had a wounderful stay again. Had problems to use the Wifi & A/C- was quickly solved by the Management! Can highly recommend this place for a vacation on Big Island! Very convenient: Shops, Restaurants & beautiful beaches all close by. Nice property, would have liked a larger pool, was a bit crowded at times. Would be nice to have an upstairs bathroom for the loft, especially with small children. Clothes lines would be nice for hanging up wet towels. Parking spots are way too narrow should add at least another foot width. Not much handicapped parking readily available. Nice to not have to worry about keys. WIFI internet not useable for Apple products inside the property, ok at business center, did have wired connection available for the netbook. Price point was very good to excellent. The internet didn't work for the last half of our stay and the blender didn't work at all. The condo was lovely, nice location, well appointed. Beautiful! However, management was a bit apathetic to our concern over the internet not working. Unfortunately, I had to work via the internet while in Hawaii, so this was an important issue. Management quickly blamed the cable provider and told us she couldn't get a hold of them on a weekend. It was only after I spent 30 minutes on the phone, that very weekend, with the provider (in which they assured me the modem WAS receiving a signal) that management made an effort to remedy the problem. Additionally, be prepared to buy your own toilet paper, paper towels, garbage bags, tissue, dish soap, etc. We were told that "this isn't a hotel" and that management only provides a "starter kit", presumably left over from previous guests, which didn't last more than a day or two. Other than indifferent management...stay was lovely. Would likely rent again. Unfortunately with island living services are often interrupted. We had advised this guest that internet service through a different provider was available near the fitness room for their use while we were troubleshooting the problem for them. Have stayed here several times. Just LOVE the location and the Penthouse Unit. No noisy neighbors above you. Short walk to everything. Was VERY glad to see that A-Bay had been repaired after the Tsunami damage a few years ago. LOVED the new "Lava Lava Beach Club" right on A-Bay. They also have 4 or 5 cottages for rent. GREAT improvement to the bay and the Waikoloa experience over all. The normally Windy Waikoloa Beach was very calm this trip. Had a GREAT time as usual and will be back soon. Always our pleasure to have you! We had a great stay this past week. The unit was clean (could have been swept through one more time and the carpets were a bit spotted), quiet, and in a great location. For those of you who like to cook, the kitchen was fine, although the cooking utensils, pots, pans, etc., was limiting at best (a lot of improvising). The barbecues by the pool were also great! Finally, the management company via the owner were great to work with. They graciously allowed us to stay in the unit well past the check-out, for a minor charge. I would stay here fact, I'd like to purchase one of these units at Fairway Villas! this was the best! the place was centrally located, clean, extremely comfortable. best sleep ever on a vacation! This is a good value for the location. 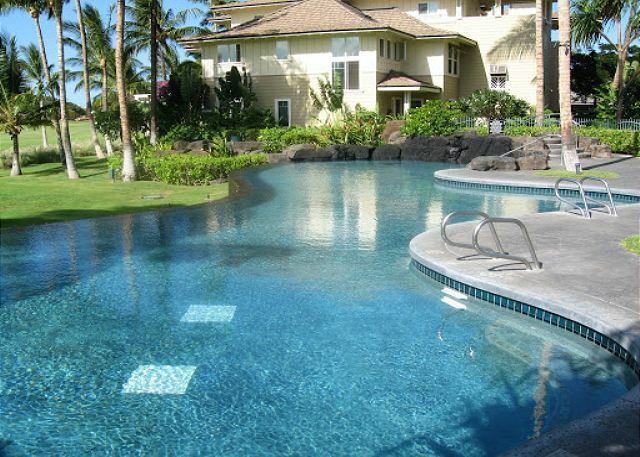 The beaches of Kohala area are within 10-15 mins driving distance. Our ten year-old has thoroughly enjoyed the infinity pool. There is also a petroglyph trail about 50 yards from the villa. 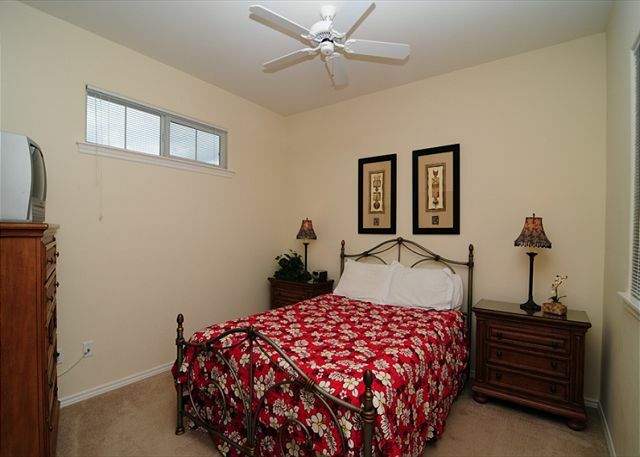 The villa is very spacious, featuring several updates. Excellent! We were disappointed with the general cleanliness,dirty hand towels,facecloths,and the lani.Only 3 coffee cups and no gratis coffee,or dressing gowns as was advertised.I would only recommend to a friend if the unit was brought to snuff.We did enjoy the quietness of the area and location near the beach and the markets. We appreciate getting this feedback, however if these items were brought to our attention during the guest's stay, we would have been happy to resolve these issues for their enjoyment. We did bring more coffee cups as they contacted us for this. Quiet, serene golf environment!! Loved the patio overlooking the green. Beautiful curb appeal when driving in. Condo was immaculate and furnished nicely. Nice modern unit with all the amenities of home. Complimentary Kona coffee watching the sunrise on the comfy Lanai chairs was a welcome treat. Good central location for island sightseeing. Highly recommended !! The rental needs more towels and pans to cook on. Could use a little more cleaning; however, it was not that dirty. Bathroom trash cans, deck and washer closet was dirty. 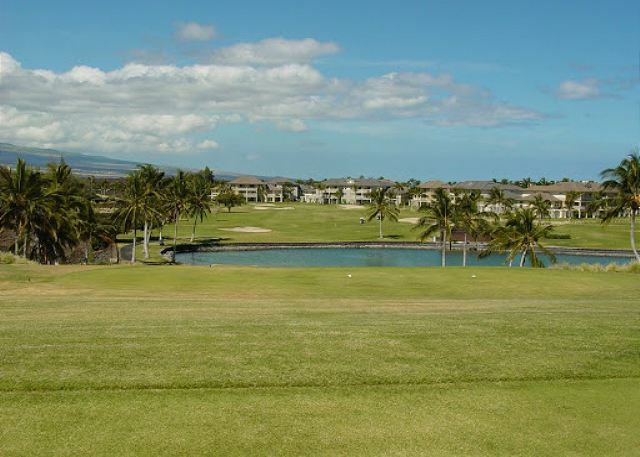 Waikoloa Resort is a great location for those wanting a golf and beach vacation. It was an easy stroll from the condo to the stores and morning coffee at Starbucks. It took us under 10 minutes from our front door to walk to our beach chair by the ocean. It was a 5-10 minute walk to the clubhouse to start a round of golf. The condo kitchen was well stocked and we enjoyed visiting with other vacationers at the shared BBQ grills each night. 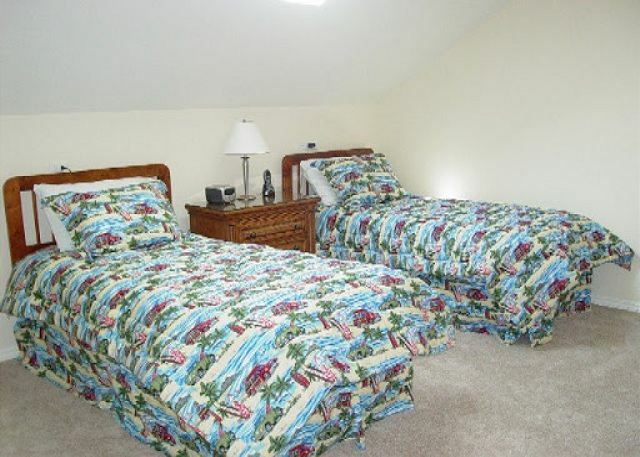 The beds were all comfortable and the overall decor was very tasteful and Hawaiian. Great location, nice condo. A safe would be nice and carpet needs cleaned. This is the 2nd time we've stayed in the unit. The 1st was in 2006 and the 2nd in 2012. Although we enjoyed our most recent stay and would certainly come again, the unit is in need of some minor repairs and upgrades(caulking around the tub, some new paint and the carpets need to be replaced). However, as always, Sandy was great to deal with and we will be back and stay in one of her units again. 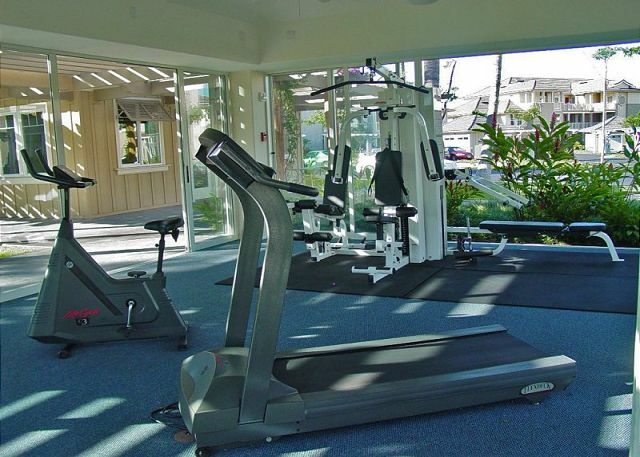 Good location for walking to the beach and nearby shops for meals and even a farmer's market. We had a comfortable villa with 4 beds and a sofa bed. Petroglyphs really close and fun to find all around area. Pool is very enjoyable with salt water. Nice and quiet in our location even at night. A few items in the place needed attention like a leaking toilet, but management said it would be fixed after we left. Stayed nine days. Overall pretty clean and spacious. We had a lovely visit. 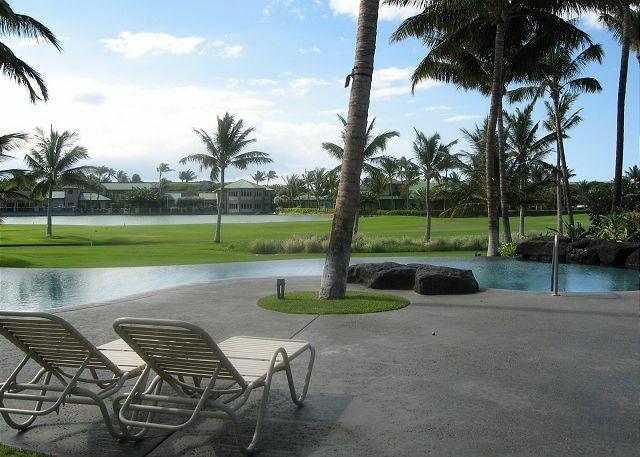 This is property is ideally located in Waikoloa; close proximity to beaches, petroglyphs, golfing, walking trails, tidal pools, the Kona airport, as well as casual and elegant dining. The unit allows for only one tight parking stall, so if someone (visitor or Waikoloa employee) happens to use your stall, you may find yourself temporarily inconvenienced. Friends visiting for dinner will have to park outside the gated community and trek in, which is fine for the anyone without mobility issues. This is an ideal island haven for a couple or a family with young/teenage children.Working with Sandy is an added pleasure.Sandy is a sweetheart. Our pleasure to host this family. There is guest parking within the gated community, however, this guest may have had difficultly finding them during the peak holiday week due to the popularity and location of this community! 6 people (we had 3 adults and 3 kids). A good beach is about 10 min walk. There is also a nice shopping center nearby. Unfortunately wifi connection didn't work. Maybe next tenants will be more lucky. The WIFI service provider had been experiencing connectivity issues which have now been resolved. Sandy was great to work with and the property was in a great location and overall in good shape. The onsite propery manager was extremely rude and unhelpful. The place was not cleaned very well. There is a goofy little switch in the sliding door that shuts off the air conditioner when the door is open. It has to be shut just right! Bad idea!!!!!! Overall this property is great. The location was awesome. My only complaint is that they do not provide paper products, like tp. If I had known, I would have bought some before hand. Otherwise I would highly recommend this property and I would stay there again. Sandy was very helpful and quick to handle any problems. This apartment was large enough for 5 people not to trip over each other. My elderly father easily walked to local shopping and was very happy to meet a dolphin at the Hilton. Roy's and SanSei have fantastic food! Our stay at the Villa was wonderful. It was quiet, clean and felt a little like home. Our rental coordinator was flexible and helpful. I don't think I've ever had such an easy and flawless rental, check in/check out and overall experience at a rental before. Thank you! It was a great place to stay, conveniently located near the Queens, Kings Shops and A-Bay which is beautiful! A few minor suggestions;more kitchen towels, dish towels and a full roll of paper towels would be helpful. Hardly any Kona Coffee was availble, only one pot worth. More laundry detergent would be nice since i had to wash bath & kit towels for 8 people.2nd level guest complained about hearing the dining room chairs everytime we moved them. Maybe sliders would help the noise? Bedroom pillows are worn out. Larger supply of Kitchen trash bags would help, only had 2 extra. Otherwise, our stay was fabulous! Thank You!! We have stayed with Sandy Vacations 4 years in a row now. Have loved each vacation. This visit we brought our Son, Daughter-in-law, and 2 grand children. They loved how close this location is to the Kings and Queens Shops. Always our pleasure to have you!! 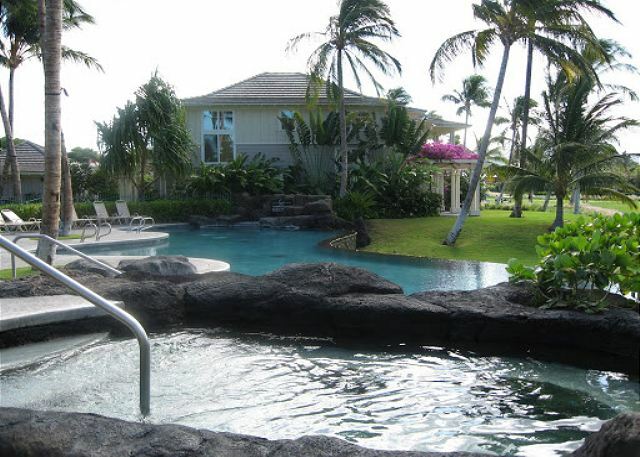 The Big Island of Hawaii is a great location for a relaxing vacation. 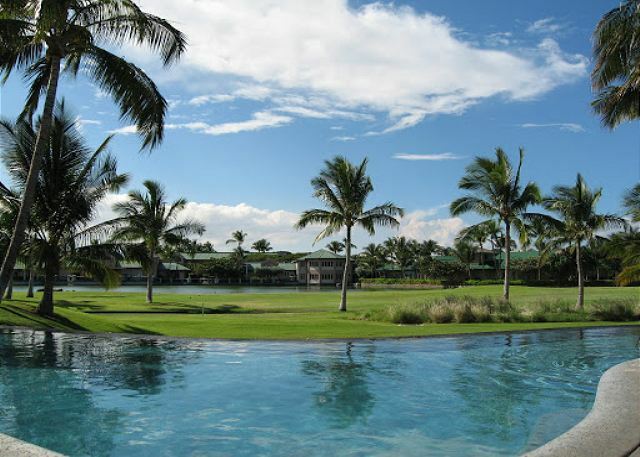 The island provides a little something for everyone including beaches, volcano's and luxurious condominiums such as what we found with Sandy Vacations penthouse villa in the Waikoloa Beach Resort. 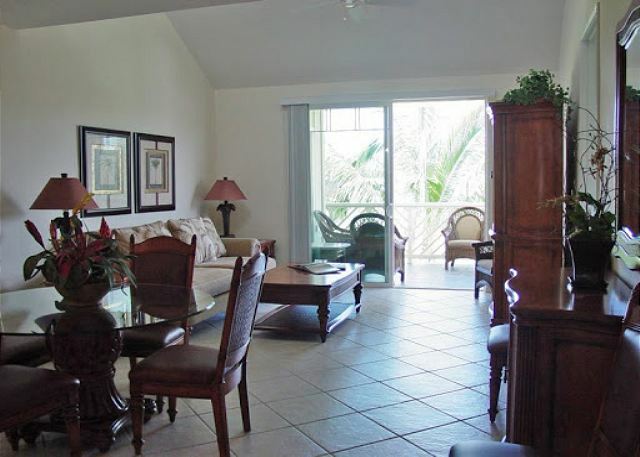 Located only steps away from shopping, restaurants, great snorkeling and gorgeous beaches, this well maintained and spacious two bedroom + loft condominium easily handled our group of 5. We would definitely recommend it and the great service received from Sandy Vacations to friends, family and others. We hope to be back there again soon. What an awesome location for a vacation!